The Braves and Dodgers were National League Division Series opponents just a month ago, but on Tuesday, the two organizations came together to produce the latest award winners from the Arizona Fall League. 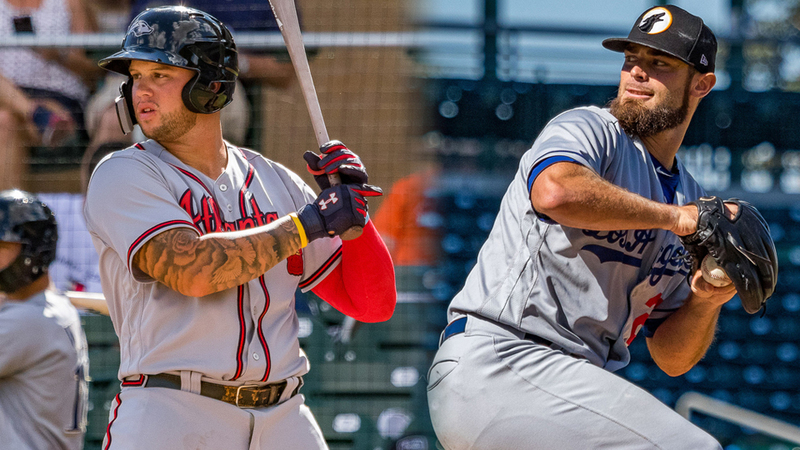 Braves first baseman Braxton Davidson and Dodgers left-hander Ben Holmes were named the AFL Player and Pitcher of the Week for Oct. 29-Nov. 4. Davidson thrived in the power department for Peoria to snag his spot among the Week 4 honorees. The 2014 first-rounder led AFL hitters in hits (seven), home runs (four), total bases (20), RBIs (seven), slugging (1.250) and OPS (1.721) over four games with the Javelinas. Those four long balls came in back-to-back games, with the left-handed slugger went deep twice in both last Tuesday's game at Surprise and Wednesday's game at home against Scottsdale. Through 13 games in Arizona, Davidson is hitting .229/.351/.563 over 57 plate appearances and is tied with Mets No. 2 prospect Peter Alonso for the AFL lead with five homers. The strong performance is much-needed for the North Carolina native, who is coming off his third consecutive season at Class A Advanced. Davidson hit just .171 with a .646 OPS over 121 regular-season games for Florida but did set a career high with 20 homers -- 13 more than he hit with the same club in 2017. Holmes made just one start for Glendale in his award-winning week but dominated in the outing, holding Peoria to one hit and two walks over five scoreless innings in a 3-1 loss last Friday. The 27-year-old southpaw fanned six Javelinas in the gem, matching his Oct. 22 outing for his highest strikeout total in the AFL this season. The 2014 ninth-rounder is coming off his most interesting professional season yet. Holmes made eight relief appearances in the Marlins system before being released on June 27. He was signed as a Minor League free agent by the Dodgers on July 6, moved into a starting role and finished the season with a 2.28 ERA, 55 strikeouts and only 17 walks in 12 appearances (55 1/3 innings) between Class A Advanced Rancho Cucamonga and Double-A Tulsa before being sent to the Fall League. Vladimir Guerrero Jr., Keston Hiura and Tyler Nevin won the AFL Player of the Week awards through the first three weeks of the season while Forrest Whitley, Scott Blewett and Gregory Soto took the pitching honors.